Vanderbilt Family Chiropractic | North Barrington, Hawthorn Woods, Lake Zurich, Wauconda, surrounding communities. WE ARE CHANGING LIVES EVERYDAY! Vanderbilt Family Chiropractic is a FAMILY oriented practice that welcomes people of all ages. We take pride in our office where you’ll enjoy a friendly, pleasant, and comfortable visit. We are honored to serve North Barrington, Hawthorn Woods, Lake Zurich, Wauconda and surrounding communities. Dr. Brian takes pride in bringing the best that chiropractic has to offer to the community. 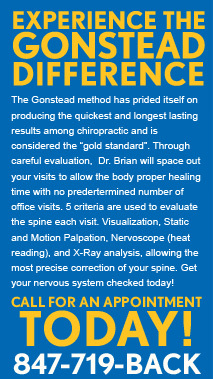 For this reason our office specializes in the Gonstead Technique which has prided itself on producing the quickest and longest lasting results among chiropractic and is considered the “Gold Standard.” Through careful evaluation the Doctor will space out your visits to allow the body proper healing time with no predetermined number of office visits. 5 criteria are used to evaluate the spine each visit. Visualization, static and motion palpation, nervoscope (heat reading), and X-ray analysis, allowing the most precise correction of your spine. Consider Getting Your Nervous System Checked Today! Dr. Brian and the staff of Vanderbilt Family Chiropractic are well known for service to the community and excellence in chiropractic care. Chances are one of your friends, family, or co-workers in the area knows us or knows of us!